This resource covers the integral, surface and deep features of proofreading. It contains full-on activities and assessments to cover the skills of literacy in an easy, structured, cover-your-bases system. It includes everything you need to get going with Proofreading in your classroom. 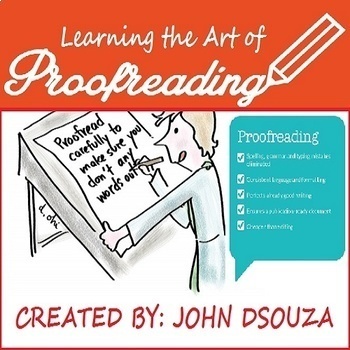 • Understand the importance of proofreading process as a tool to improve writing skills. • Proofread a writing to ensure that it is accurate and well-structured. 1. Analyse and ensure that the proofreading is done accurately by paying attention to the following: conventions, capitalization, word use and punctuation. 2. Demonstrate command of the conventions of standard English grammar, usage, capitalization, punctuation, and spelling when writing. 3. Develop and strengthen writing as needed by planning, revising, editing, rewriting, or trying a new approach, focusing on how well purpose and audience have been addressed. Teachers can use this to enhance the writing skills of the learners, especially the technique needed to proofread a writing to ensure that it is accurate and well-structured.